"Cheesecake batter made with light cream cheese is swirled into a brownie base to make a rich tasting marbled chocolate treat." Mix brownie mix, applesauce, 2 egg whites and water until well blended. Pour into 13x9-inch pan sprayed with cooking spray. 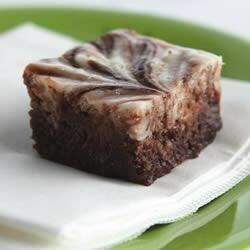 Beat cream cheese spread, sugar, flour and remaining egg white with mixer until well blended; spoon over brownie batter. Swirl gently with knife. Bake 28 to 30 minutes or until toothpick inserted in centre comes out with fudgy crumbs. (Do not overbake.) Cool completely. I loved these! I added a 1/2 block more of the cream cheese, it was more flavorful...wonderful! These were okay, but the brownie batter was a little runny & the cream cheese part was a little cakey. My kids loved them, but I'd prefer using a different recipe. I made this for my friend's bday and it was a big hit! Everyone loved it! I even made it a little healthier by using 1/3 fat free cream cheese! Excellent recipe! thanks! Made as directed, needed something else? Little bland, not brownieish enough for what we were looking for. Probably won't make again.